The Amazon Fire TV doesn't exactly roll off the tongue, but the new set-top box is currently rolling off the assembly line and shipping to US customers. The world's largest online retailer spent a significant amount of time demoing its 1080p capabilities all while knocking its rivals like the Apple TV, Chromecast, Roku 3 and Roku Streaming Stick. There are a few questions left unanswered in regards to the release date outside of Amazon's home territory and if the price will be translated fairly. As we test out the Amazon Fire TV for review, here are the basics that you need to know about the first streaming hardware from the Kindle-maker. Amazon Fire TV is currently on sale in the US for $99 (about £60, AU$107), but we don't expect this price conversion to hold up when it comes to the UK and Australia. As a direct competitor to Apple TV and Roku 3, it may be closer to the £99 and AU$109 that it costs to buy one of Apple and Roku's set-top boxes at retail. That's still the sweet spot for new streaming platforms shared by everyone except the Google Chromecast right now. Chromecast costs $35 (£30, about AU$33), and the new Roku Streaming Stick is a little bit cheaper than Amazon Fire TV, but both rivals don't have the internal specs to match. Amazon surprised everyone by announcing that its streaming hardware is launching today in the US. It's currently available to buy and can ship to any State-side address with Amazon's convenient Prime two-day free shipping service. There's no UK or Australian release date attached to Amazon Fire TV. That's typical of video streaming platforms that require a different set of apps and separate licensing agreements. However, Amazon is no stranger to scaling for international regions, as evidenced by its global availability of the Kindle Fire HDX tablets. Amazon Fire TV may have the same compact form factor as the Apple TV and Roku 3, but it's packing three times as much processing power and four times as much memory. That because worthy Qualcomm components line this set-top box that's as tall as a dime. There's a Snapdragon 8064, a Krait 300 1.7 Ghz quad-core processor and a dedicated Adreno 320 GPU. Along with 2GB of RAM, this should boost its 1080p video streaming speeds and be able to handle gaming capabilities to the best of what the Android platform has to offer. Also essential to its speed, the quad-core Amazon Fire TV includes a dual-band dual-antenna MIMO WiFi antenna for fewer dropped connections. Only the dual-core Roku 3 offers that too. 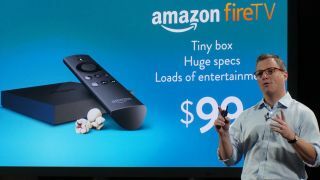 Amazon chose to launch its first streaming hardware as a set-top box instead of going with the emerging trend of designing a thumb-drive-sized stick like Chromecast or the Roku Streaming Stick. There are some advantages to this decision. On the outside, Amazon is able to fit more ports and supply living room dwellers with more connectivity options. HDMI out, optical audio out, Ethernet and a USB port adorn the back of the Amazon Fire TV. You won't find optical audio or an Ethernet port on a dinky streaming stick. Being able to hardwire Amazon Fire TV to a router through Ethernet is a huge advantage for a house that has WiFi connectivity issues and wants unfettered streaming speeds. You won't be waiting around for too many keys apps with the Amazon Fire TV. Unlike Chromecast, there are going to be more than a measly five apps at launch. Amazon Instant Video will obviously be leading the way, which is a huge deal as its not natively available on Apple TV or Chromecast. But Amazon is also inviting outside competitors into its "open ecosystem." This includes Netflix, Hulu Plus, Pandora, Crackle, iHeart Radio and even Google's own YouTube.